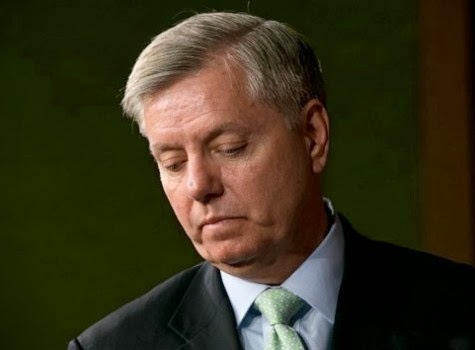 SUNLIT UPLANDS: Will Lindsey Graham Face a Serious Primary Challenge? Will Lindsey Graham Face a Serious Primary Challenge? It’s becoming more and more clear that Senator Lindsey Graham is on shaky ground with the GOP electorate in SC. Multiple county GOP groups have recently passed censure measures against him, and by overwhelmingly large margins, with other counties soon to vote on similar censure measures. A recent poll conducted by Landmark Communications and Rosetta Stone Communications showed that Graham only reaches 42% of the vote against his field of primary challengers, and still falls short of 50% against any of them in a head to head matchup. Adding to voter frustration over Graham, is his recent vote in favor of cloture on the Senate version of the Harry Reid amended CR bill which allowed full funding for Obamacare, something the House had stripped out in its version before sending it to the Senate. The cloture vote required at least 60 votes, so it could not pass without at least 6 republican votes, and once cloture was invoked it meant that the bill would be voted on as is with the Obamacare funding and only need 51 votes to pass. Many conservatives believe the process was a setup between the powers that be in both parties. That was the main purpose of Senator Ted Cruz’s 21 hour filibuster, to try and bring attention to the fix. Though Graham did vote against the actual bill, by voting for cloture, many conservatives feel that he cast a de-facto vote in favor of Obamacare funding.